Ajax and Real Madrid clashed again for the UEFA Champions League and the story of the game ended up being a repetition of the previous years. The Merengues punished the Dutch side with a 1-4 win and are now leading the group with 6 points earned out of 2 fixtures. Cristiano Ronaldo was the most shining star of the night, as he completed his first career hat-trick in a Champions League game. Real Madrid sweeped aside the Dutch champions Ajax, as they visited the Amsterdam Arena and made a statement with an impressive 1-4 victory. Cristiano Ronaldo added 3 more goals to his growing goal tally, after netting his first hat-trick ever in a Champions League game and becoming the competition's top goalscorer (4 goals), with only 2 fixtures played so far. 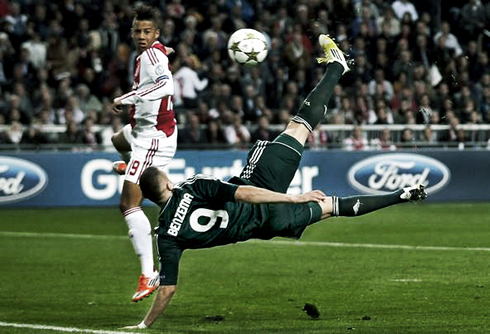 Who also scored a screamer last night was Karim Benzema, in what was probably one of the best goals the Frenchman has ever scored in a Real Madrid jersey. The game turned out to be an easy one for José Mourinho's men. With a Clasico between Barcelona vs Real Madrid right this Sunday, the timing for such a victory couldn't have been better! The UEFA Champions League has basically been working as a sanctuary for Real Madrid, especially after the troubled start in the Spanish League. With this victory against Ajax, the Merengues extended their winning streak to 4 games and will now start preparing the next La Liga clash, against their arch-rivals Barcelona. 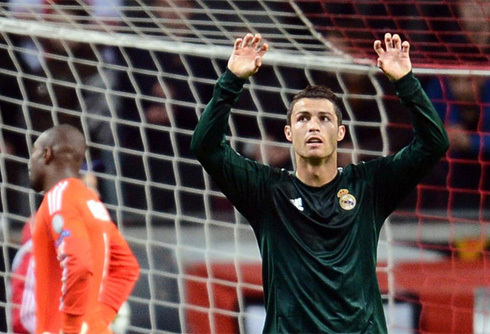 As for last night, Cristiano Ronaldo and Karim Benzema put on a show and fueled the victory for the visitors, in another calm night at the Amsterdam Arena. There was no early goal against Ajax, but truth has to be said that the main responsible for that to happen has been the Dutch side's goalkeeper, Vermeer. Kaká, Ronaldo and Benzema made several attempts to score the opener, but saw them all being denied by Vermeer, at least for most of the first-half running time. The Dutch resistance lasted for almost 42 minutes, when Cristiano Ronaldo had his first of the night from an easy tap in. The ball was delivered from a good initiative pulled off by Karim Benzema on the left attacking side and Ronaldo simply showed his nose for goal and fast reaction skills, that tend to allow him to be at the right time and at the right place, in endless occasions. No further significant events took place until half-time, as Real Madrid headed to the locker rooms with an always dangerous single goal advantage. Perfectly aware of the importance of next weekend's Clasico against Barcelona, José Mourinho probably instructed his pupils to push forward and seek for a fast second goal that would allow the team to manage and control the game in a less exhausting way. If that really was the case, it took only 3 minutes for the Merengues to fulfil their manager wishes and get two goals up. With 48 minutes on the clock, the Amsterdam Arena was about to witness one of the greatest goals of this season's UEFA Champions League so far. A very fast counter-attack play from the Merengues conducted by Marcelo, saw the ball being sent to the right side, destinated to Kaká. The Brazilian midfielder, who was susprisingly picked to be on the line-up last night, controlled the ball and sent a perfect cross to the far post, where Karim Benzema pulled off some sort of an half volley and bicycle kick, extending Real Madrid's lead to a two goal advantage. The Frenchman seems to be picking his top-form and it's going to be interesting to know if Mourinho is going to put Higuaín ahead of Benzema on Real Madrid's line-up, for this Sunday's "Clasico" against Barça. However, Ajax didn't throw the towel just there and got their goal 8 minutes later, near the 56th minute of the game. Real Madrid showed once again how vulnerable they still are when defending set-pieces, as they conceded another goal from a corner kick taken on Ajax left attacking side. A long cross was sent to the far post, forcing Iker Casillas to hesitate for a bit and stay put near the goal line, while at the same time, Essien lost his marking reference. The result was an Ajax player being left completely alone and with plenty of space to head the ball into the back of the net. Iker Casillas didn't look very well on the picture and Mourinho is sure to have a lot to review and work at once more, as several technical aspects concerning his team's defense in set-pieces seem to be failing over and over. From that point on, Real Madrid appeared to have lost the control of the game and Ajax's belief in coming out with a positive result grew stronger. Things wouldn't calm and settle down until the 79th minute of the game, when Cristiano Ronaldo decided to step up and restore the two goal advantage to his side. Karim Benzema spotted his Portuguese teammate standing alone in front of Ajax's penalty area, passed him the ball and saw Ronaldo curling a great shot from outside the 18-yard box, beating Vermeer for the second time on the night. Ronaldo's performance would still be enhanced a couple minutes later, precisely when the 81st minute was shown on the board. Ajax exposed themselves even more and when that happens, Real Madrid usually doesn't forgive through their trademark counter-attacks. Sami Khedira, who came in to the game during the 2nd half, assisted Ronaldo on the left for the Portuguese to run straight ahead with the ball towards Ajax area. What happened next was that the Real Madrid star showed just a glimpse of his brilliance and lobbed the ball over Vermeer with a splendid touch from his left foot. With this goal, Ronaldo reached a total amount of 12 goals this season (all competitions being accounted) and his 4th in the UEFA Champions League, which allows him to be leading the competition's top goalscorer standings. Last night's hat-trick was also the first one that Cristiano Ronaldo obtains in an European game and it came just 4 days before the first "Clasico" in La Liga this season, as Barcelona vs Real Madrid is set to kickoff this Sunday afternoon, at 19:50 (local time in Spain). Cristiano Ronaldo's next game for Real Madrid will be against Barcelona, next Sunday (07-10-2012), for the Spanish League. You can watch Juventus live stream, Barça vs Real Madrid, Newcastle vs Bordeaux, Liverpool vs Udinese and Panathinaikos vs Tottenham, all matches provided from our football live streams section.